Multiple hurricanes and wildfires made 2017 the most expensive year on record for disasters in the US. 4.7 million Americans filed for disaster aid through FEMA, but about 200,000 applications are suspected to be fraudulent. The massive Equifax data breach may be partly to blame for the uptick in fraudulent FEMA applications. 2017 was an especially costly year for the US government. Multiple hurricanes tore through parts of the South and wildfires ravaged California, making it the most expensive year on record for disasters, according to the National Centres for Environmental Information. The US was impacted by 16 separate billion-dollar disasters in 2017, totaling $US306 billion in economic losses. As a result of the wildfires, hurricanes, and storms, millions of Americans were displaced and forced to rely on federal disaster aid. According to the Economist, 4.7 million FEMA applications were filed in 2017 – a tenfold increase from 2016. But David Passey, a spokesperson for FEMA, told the Economist that more than 200,000 of those applications – about 4.25% of all claims filed in 2017 – may be fraudulent. The massive Equifax data breach may be partly to blame for the rise in suspicious applications. In September 2017, Equifax, one of the three credit reporting agencies in the US, announced it was compromised between mid-May and July, potentially exposing Social Security numbers, credit card numbers, and other personal information for up to 143 million Americans. Joe Raedle/Getty ImagesUnfortunately, large-scale data breaches aren’t the only opportunity for criminals to steal your information. Disaster fraud isn’t anything new, but the timing of the Equifax breach may have made it easier for fraudsters to get their hands on personal data and file fraudulent FEMA applications – a case of sophisticated identity theft. 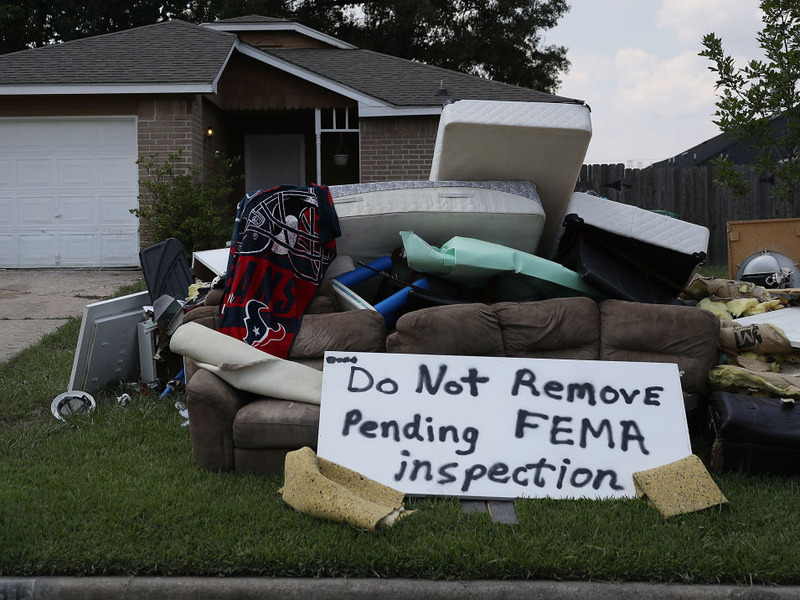 “To swindle payments from their rightful recipients, criminals had to match breached private information to addresses within federal disaster zones,” the Economist reported. FEMA can award up to $US30,000 in emergency aid per household, but most payments are much smaller. But large-scale data breaches like the Equifax leak aren’t the only opportunity for criminals to steal your information. In 2016, 4.2 billion personal records were stolen. If someone wants your data, it’s probably already out there. The vast majority of identity theft victims – 86% in 2014 – have problems with a current account, such as a credit card or bank account, according to BJS data. In December, the FBI set up a task force to investigate fraud claims related to FEMA applications. FEMA has notified applicants of additional security measures put in place to prevent fraud. Anyone caught trying to make a fraudulent claim faces up to 30 years in prison and a $US250,000 fine if convicted. If you apply online and receive a verification error, call FEMA directly for explanation. If you haven’t applied, don’t give your personal information to anyone claiming they are verifying your application from FEMA. Don’t trust anyone who comes to your home for an inspection without a FEMA badge or someone who asks for money to complete an inspection or application. If you suspect you have been defrauded, contact the Department of Homeland Security Office of Inspector General, FEMA’s Office of the Chief Security Officer tip line, the National Center for Disaster Fraud Hotline, or the Federal Trade Commission.